Does EFNARC (Experts for Specialised Construction and Concrete Systems) certification ring a bell? 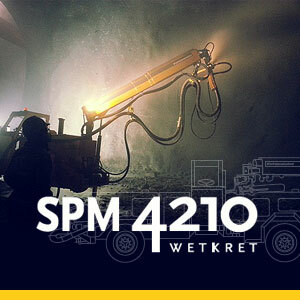 Would you like to learn more about this important organization in the world of shotcrete? Great, because today, we’ve got something special for you: the second interview in a series on EFNARC and its certification. You can check out our first interview right this way. For this installment, we’ve reached out to Jose Antonio Vigo Robles, mechanized shotcrete equipment operator with EFNARC certification, to talk about his experience as a certified operator. We hope you enjoy the interview and get inspired to do the same! Hello, José Antonio. Can you tell us a bit about yourself? What’s your background? Absolutely. 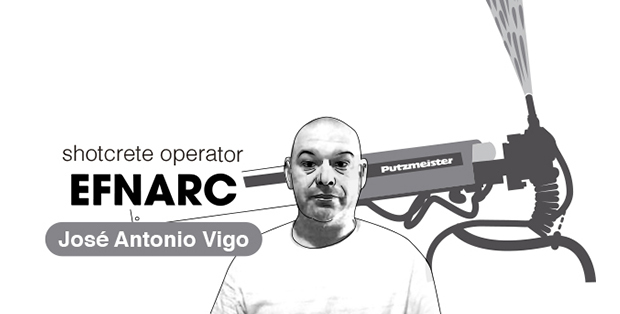 I’m from Málaga (Spain), I’m 44 years old, and I’m an EFNARC-certified shotcrete operator. As far as my professional experience goes, I’ve mostly focused on projects in the civil works sector, both in Spain and abroad. Since the end of 2016, I’ve been living and working in Portugal, on a hydroelectric project for a leading Spanish power company. What drew you to your line of work and how many years of experience do you have under your belt? It’s hard to believe, but I’ve been a shotcrete operator for 18 years now. I was first drawn to this line of work during the big civil works boom in Spain. The country was buzzing with activity and I couldn’t help but want to be a part of it. I can’t believe it’s almost been two decades since then. Can you comment on some of the projects you’ve been a part of? Of course. Like I said before, the bulk of my experience is in the civil works sector, and always in tunnels. I’ve collaborated on projects such as the Madrid metro, the construction of the high-speed Guadarrama tunnel, the London metro, among others. Would you say that your profile is more sought-after now that you’re an EFNARC-certified operator? It really depends on the project in question. For some projects EFNARC certification is a requirement, while for others it isn’t. So it varies. Now that you have EFNARC certification, do you find that you’re more concerned when it comes to safety in underground construction? Absolutely. Mind you, I’ve always taken my job very seriously, but with the certification, I’m that much more aware of my surroundings, and of the whole safety component of my job. Do you ever run into other EFNARC-certified shotcrete operators on jobsites? Do you comment on the certification at all? Yeah, that’s actually happened more than once. We always talk the bad habits we’ve corrected since the certification, and about how we’ve grown as operators. How was your experience with the Putzmeister staff that examined you? My experience with Putzmeister was excellent. How do you recommend an operator prepare for certification? Is there anything to keep in mind? The most important thing is to trust yourself. Aside from trusting yourself, you need to be aware that your way isn’t always the best way, and that you’re there to learn. You really need to go into it with an open mind, so that you can take as much as possible away from the experience. Finally, would you say that your application has improved thanks to the certification? Very much so. I’ve corrected my bad habits over time, and am grateful for that. Are you an EFNARC-certified shotcrete operator? Let us in on your experience in the comments. Crossrail is a new railway link that will dramatically cut travelling times within London, and is currently Europe’s largest infrastructure project with a total price tag of £14.8 billion. On completion, some 42 km of new tunnels will be excavated under the city, increasing the capital’s rail transport capacity by 10%, considerably reducing travel time and easing congestion on the network.